A floating element ensures high imaging performance into the 30 cm (12 in) near-focusing range. Extremely compact design using elements with high refractive indices and low dirspersion values. Exceptional freedom from flare, due to special multiple coatings. Distinguished for superb imaging performance and long service. Includes case, hood & caps. 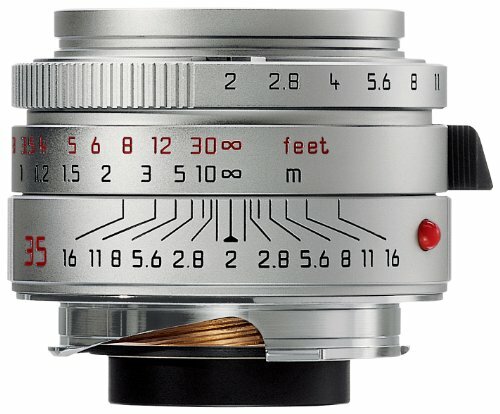 Years ago, every 35mm camera was offered with a "normal" or 50mm lens. This focal length closely matches the diagonal of the 35mm film plane and was considered the best compromise for general photography. Not too short, not too long - just right. Features very good contrast and sharpness across the entire picture area even at full aperture. Vignetting is hardly discernible with the lens wide open. 138. Leica Photo Adapter for 62mm Televid Spotting Scope.